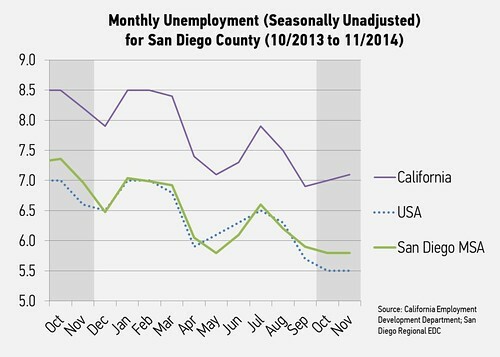 The California Employment Development Department (EDD) released statewide county employment data today for the November 2014 period, and much like the national report released two weeks ago, San Diego County experienced another month of outstanding job growth. San Diego County employers added another 13,100 jobs in November, which makes it 60,800 jobs added so far in 2014. When looking at year-over-year growth, the region added 43,000 jobs, which is the most in 20 months. The annual job growth rate was 3.2 percent growth, which eclipsed the U.S. total employment growth rate of 2.0 percent over the same period. San Diego County’s unemployment rate remained flat at 5.8 percent and fell by 1.2 points from this time last year. The unemployment rate in the region was 1.3 points below California’s 7.0 percent rate and tracked just above the U.S. average of 5.5 percent, which also remained flat. While the unemployment rate didn’t decline, it did remain flat amid 4,000 new labor force participants, indicating that job seekers are finding employment. Job growth continued to be fueled by our private sector. 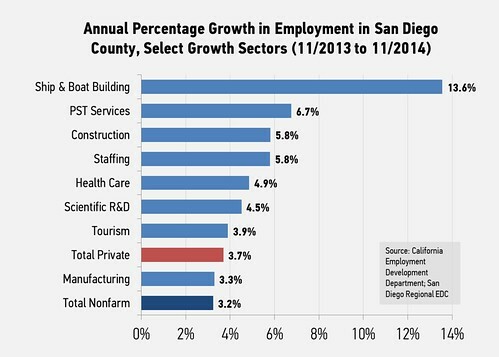 San Diego County private businesses added 10,600 jobs in November and 40,500 since one year prior. Over the past year, private businesses have accounted for more than 94 percent of job growth in the region and grew by about 3.7 percent. This includes our goods producing industries which grew by more than 4.3 percent over that period—well above the national average. While goods producers have outpaced service providers in annual averages, service providers offset seasonal losses from goods producers in November. Most of this can be attributed to retail stores addressing holiday shopping needs while construction projects experience a seasonal slow down. Retail jobs alone accounted for more than 60 percent of private job growth last month, while construction and manufacturing businesses shed 1,700 jobs. Despite the seasonal downturn, construction and manufacturing drove more than 16 percent of the region’s annual private job growth from November 2013 to November 2014. These industries added 6,800 jobs over the same period and outpaced total job growth. In particular, the ship and boat building sector grew by 13.6 percent over that period, which is a good sign for the region’s blue economy. Other innovation sectors continued to show annual job growth. The professional, scientific and technical services (PST) sector grew by more than 6.7 percent and represents many of our innovation employers. National PST employment only grew by 3.2 percent over that period. More specifically, scientific research and development services, which represents many cleantech and life science companies, grew by 4.5 percent since last November. The region’s other important growth sectors continued to grow above the regional average. The health care sector grew by 4.9 percent and is one of the region’s largest employers, representing 157,500 jobs. Another large and impactful industry, tourism, experienced 3.9 percent growth over that period. 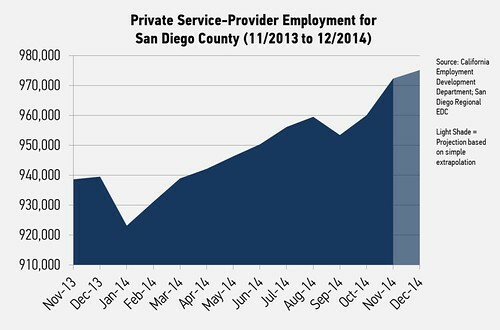 Finally, staffing services continued to grow rapidly—a good indicator of company growth. 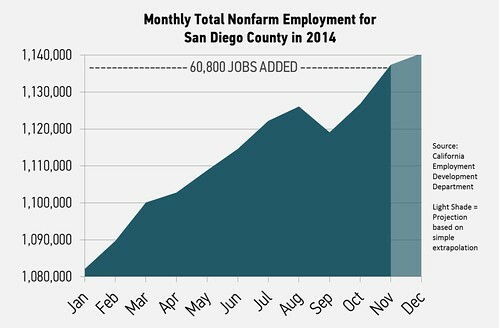 It remains clear that 2014 has been an outstanding year for job growth in the region. 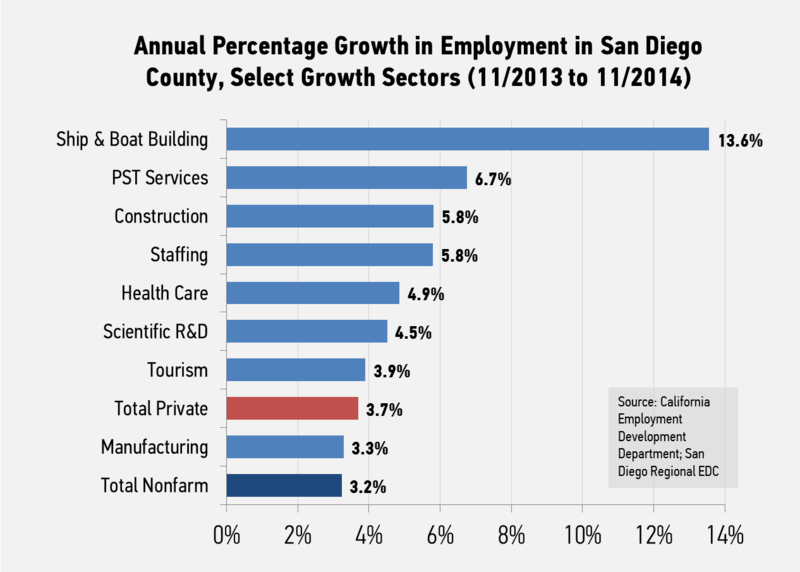 San Diego’s key traded industries led the way and the region is far ahead of the pace many anticipated at the outset of the year. The region continues to outperform the U.S. both in total employment and in key sectors, and job seekers continue to return to the economy and find jobs. It will be exciting to see how the region closes out the year when December figures are released next month.